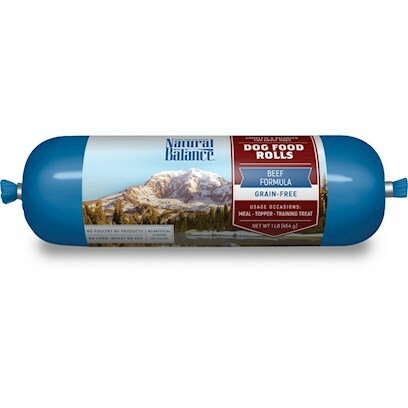 This meaty dog food roll will appeal to even the pickiest eater with the delicious taste of premium beef! Versatile and economical, each Beef Formula Dog Food Roll offers a complete and balanced nutrition for healthy adult dogs, deigned to support a healthy skin condition and shiny luxurious coat. You can chop, grate, or crumble the roll on top of dry food to offer your dog a variety of taste and texture. Very versatile option, excellent to use as a training treat or reward, as well as your dog's primary food. Beef, Peas, Beef Broth, Cane Molasses, Beef Liver, Sugar, Glycerin, Lactic Acid, Pea Fiber, Canola Oil (preserved with mixed tocopherols), Dried Egg, Salt, Natural Flavor, Natural Smoke Flavor, Sweet Potatoes, Carrots, Monosodium Phosphate, Potassium Chloride, Vitamins (Vitamin E Supplement, Vitamin A Supplement, Thiamine Mononitrate, Niacin, d-Calcium Pantothenate, Riboflavin Supplement, Vitamin B12 Supplement, Pyridoxine Hydrochloride, Vitamin D3 Supplement, Folic Acid, Biotin), Minerals (Ferrous Sulfate, Zinc Oxide, Copper Amino Acid Complex, Manganese Sulfate, Potassium Iodide, Sodium Selenite), Calcium Propionate (preservative), Celery, Choline Chloride, Zinc Propionate, Mixed Tocopherols (preservatives), L-ascorbyl-2-polyphosphate (Source of Vitamin C), Rosemary Extract.